Before you book apartment rental in Minsk for short or long stay, you need to learn a few things. You can be easy a victim of scam of some websites you can find on the internet by search phrases related to Minsk apartment rentals. How does this rental scam looks like, you might ask. Well, it’s very simple scheme that some smart Belorussian guy applied to their websites. They have many apartment rentals, but the price is sometimes three times bigger. We can easy prove to you that fact, but it’s just not worth for us to dig into this deeper. So, let’s say apartment rental in Minsk cost a $100 a day. It has a wonderful location and foreigners really love to rent this place for short or long stay. But some websites are selling this apartment for over a $250 a day. You can lose in a matter of seconds over $500 if you would like to book this apartment on their website for a few nights. Now, imagine what would be if you would like to rent an apartment from Minsk scammers for two weeks or even more? They can buy a used car after a few scammed to death clients. 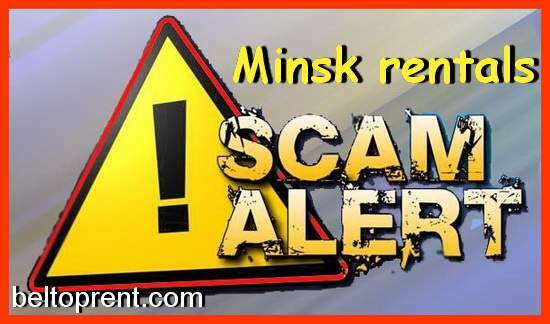 To protect yourself from Minsk apartment scammers you need to learn a few rules. Almost all Minsk apartment rentals you can find on the internet are overpriced. Especially if you see on the website many beautiful flats. It is clear that the owner of the website working as a middle man. He just put on his website the best apartments you can find in Minsk city center for rent and trying to scam guys by overpricing rentals as much as he wants. How can you protect yourself from this kind of scam? Easy! You can contact us with the link to apartment you are going to book. Just in a few minutes you will get from us real price for this apartment. If the price the same, go ahead and book it. If the price is higher, we can help you to book it straight from apartment rental manager with original price. Also, you can always find all top apartment rentals in Minsk using our search engine on the pages dedicated to apartments or hotels in Minsk. In this case, you will never pay higher price. Rental will cost exactly the price that apartment manager charge. By the way, Apartment Hotel BelTopRent working on gathering on our website all the best apartment rentals you can find in Minsk directly from owners or managers. All prices will be the same as the y charge in local ads. If anybody of managers will try to scam our clients their listings will be blacklisted in order to protect all future tourist from problems with renting an apartment in Minsk. « Want to Rent Abroad for Holiday?